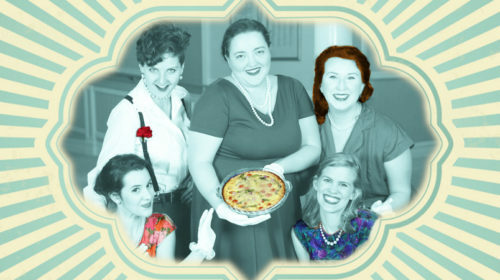 The award winning Proud Mary Theatre Company’s second production, “5 Lesbians Eating A Quiche” plays out during the annual Quiche Breakfast of the Susan B. Anthony Society for The Sisters of Gertrude Stein. The 5 characters on stage and ALL audience members are full members of the society and participation is involved and encouraged. And the experience is hilarious and entertaining. Written by two males, Evan Linder and Andrew Hobgood, the story deals with female friendships, fealty, frailty, flirtation and, what else, feminism. Linder and Hobgood’s dialogue is funny and the action fast paced and occasionally a bit chaotic (Did I see a bit of The Chicken Dance at one point?). The 70 minutes that the show runs go by in the blink of an eye. 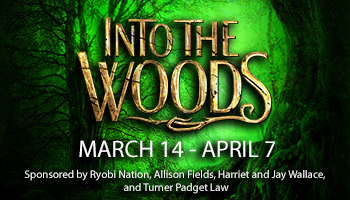 The playwrights are only partially responsible for the topnotch entertainment of this show. The rest of the credit goes to the superb cast of Taylor Davidson, Caroline Jane Davis, Brook Nelson, Micah Israel Miller and Paige Vasel. Although a true ensemble piece, each of these actors brings star quality and effect to their roles. We first meet Miller who plays Vern, the “macho” Buildings and Grounds chairperson with a tough exterior over an inner soul looking for love and companionship. Davis plays Wren with a delicious set of contradictions, she is the excited and excitable Events chairperson who is both organized and disorganized and who can’t quite decide if she is a leader or a follower. President Lulie as played by Nelson is a repressed, bossy control freak who only knows one way to do things, hers. Although each of these first 3 actors is excellent. Kudos go to the final 2 members of the cast for especially strong work. Ginny is the newcomer to the Society from Manchester England and Davidson infuses her with quiet energy as she tries to do it all and experience it all while being held back by the society’s president and pursued by Vern. Davidson also brings a convincing innocence and naiveté to Ginny and at first the audience is thinking, “is she, or isn’t she?” No one who sees this show will ever look at eating a quiche in the same way after seeing her do so here. Finally, Vasel packs the society’s “pose” pre-occupied picture taking historian Dale with energy and joy. Before ultimately making a great sacrifice, she captivates the audience with a monologue that is equal parts somber and silly. Whenever Vasel is not on stage, the audience misses her. There’s a lot going on in this little one act farce. There are themes of desensitizing people to terms and labels as the entire audience at one point must admit to being lesbians. There is not so subtle use of symbolism beginning with the world’s most perfect food, the egg and, of course, the venerated quiche, kept meatless of course. An Individual’s act of heroism for the greater good of the group is played out. And there are even brief moments of hints of serious themes related to fictional classics like Animal Farm or Lord of The Flies. But in the end, it succeeds as a bit of zany comedy. The thrust stage works well to promote the society “meeting” atmosphere. The simple but colorful set, designed by Katherine Rausch, is very effective. Kate Roark’s direction is very strong bringing seamless action without heavy-handedness. The kind of direction most appreciated by actors and audiences alike. If you want to laugh heartily during 70 minutes of fast paced action, go see one of the remaining performances of 5 Lesbians Eating A Quiche.